Well, the girls and boys were out today on Cairngorm. Here Kathy Grindrod’s snowpit on Coire Cas headwall clearly shows the interface between the new slab and the hard crust below. 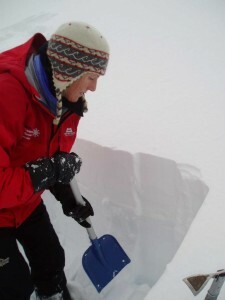 The deeper old snow below has not yet frozen, so breakable crust exists in many locations. It was quite cool today with summit temperatures around minus 2 Centigrade, so here’s hoping for a wintry winter!